Nirvana pass is a mecca for ski mountaineering in the Coast Mountains for good reason. This famous yet wild and untravelled location is spectacular! © All Rights Reserved. 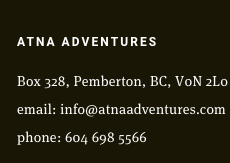 Atna Adventures 2019.